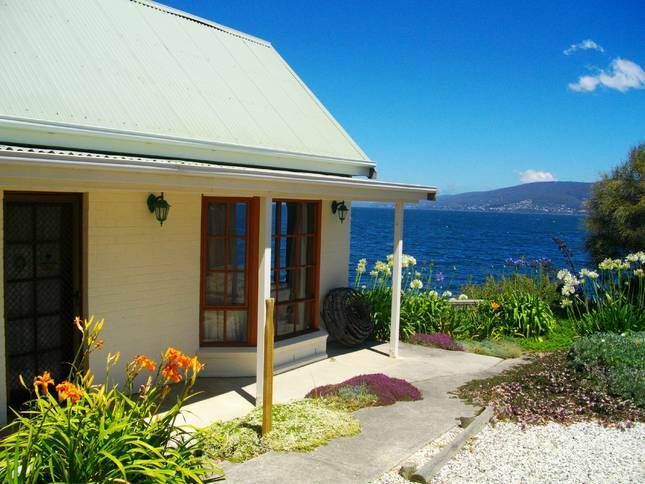 Shack on the Edge is a stunning, private, absolute waterfront cottage that boasts one of Australia's most spectacular views with the magical sights and sounds of the harbour and the city of Hobart. It offers couples a private and exclusive retreat in which to sit and revel in the seclusion and quietness. Against the dramatic background of Mount Wellington you can watch racing yachts, cruise ships and fishing boats as well as the occasional passing dolphin. It is ideally located approximately 15 minutes commuting distance from the Hobart CBD and 15 minutes from the Hobart Airport. The cottage consists of a lounge, dining, kitchen area with an open loft. Off the kitchen is the bedroom with a king size bed and an en-suite bathroom. Facilities include a refrigerator, microwave oven, cook-tops, cooking utensils, LCD television, IPod/MP3 dock radio, CD player a front loading washing machine and a drier as well as a washing line and garden. Waterfront patios are available for outdoor dining. The cottage also includes under-floor electric heating and a heat pump that provides cooling or additional heating whenever necessary. Shack on the Edge is an ideal location to relax and unwind. Sit and watch the waves roll onto the shore a few metres from the large windows in the lounge, or take a leisurely walk along the local beaches. Walking distance - Howrah Beach, Gourmet Shopping, Chemist, News Agent and Post Office, Tennis Courts, Bellerive International Cricket Ground, Hair Dresser, Supermarket, Bottle Shops, Hotel, Petrol Station and Bus stop. Salamanca Place, MONA (Museum of Old and New Art), Local Wineries, Port Arthur Historic Site, Cadbury Chocolate Factory, Harbour Cruises, Bonorong Wildlife Park, Tasmanian Distillery, Botanical Gardens, Mt Wellington, Peacock Theatre, Battery Point Walking Tours, Salamanca Arts Centre, Wrest Point Casino, Bruny Island, coffee shops and restaurants. What a great location! Right on the waterfront of the Derwent River, with the sound of lapping waves and fantastic views of Hobart and only 15 minutes or so to the Hobart CBD. The owners were welcoming and helpful, but completely respected our privacy. Great accommodation with fantastic view. Close to city, of high quality and terrific hosts. Sounds of water very relaxing. Everything we wanted for our stay. My partner and I stayed for 4 nights at the Shack which is not a "shack" at all. It is a very lovely clean and modern cottage perched right on the waters edge with a view in all directions over the water, delightful of the day watching the yachts and romantic of the evening looking over the lights of Hobart city. Doug and Sue were excellent hosts and welcomed us when we arrived but provided us with every privacy during our stay. The location is perfect and we will definitely be returning to stay again. Lovely property. Quiet location. Wonderful views. Great property in perfect location. Ideal for a couple. Property well equipped. We had a great time there and it served well for us to go into Hobart during the day. Coming there in the evening was a nice chance to slow our pace down and relax. Sue and Doug were very helpful and provided us with great information.